Stretch marks - we all have them! Whether you loathe them or tolerate them, some people want to get rid of them for good. Whilst removing them would cost a lot in money and time in laser removal or surgical removal, some people are content with simply reducing their appearance with lotions and potions. Enter: InstaNatural. 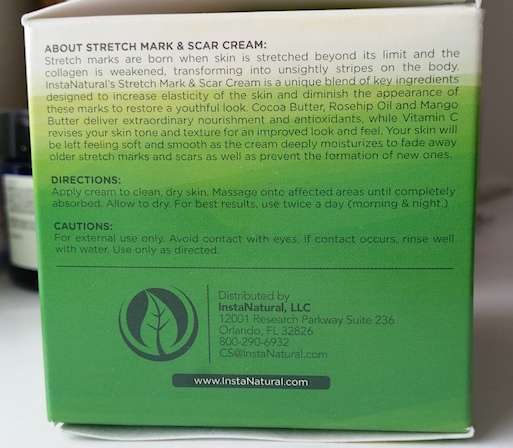 InstaNatural’s Stretch Mark and Scar cream is an all natural, powerful cream that helps to reduce the appearance of scars and stretch marks. 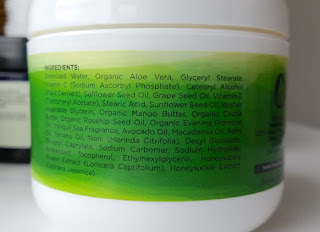 It contains aloe vera, Vitamin C, Rosehip Oil, Cocoa Butter, Evening Primrose Oil, Grapeseed Oil, Vitamin E and Mango Butter amongst other essential oils and other ingredients. 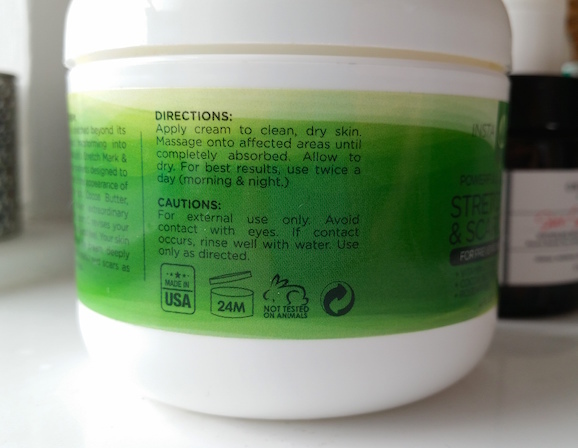 It comes in a white, screw cap pot that has a green label around the centre with the product information and that holds 120ml of product. The cream itself has the consistency of and looks a little like yoghurt. It also has a nice smell to it that lasts throughout the day (the ingredients label it as “Tranquil Sea Fragrance” - oooerr!). To apply, take a small amount on your fingers and gently massage into the affected area until it is fully absorbed. For best results, use both morning and night. With these types of products I tend to use them with an open mind. It can be easy to expect too much and feel deflated when you don’t get the results that you imagined. Because of this, I was incredibly impressed when I began to see results after only a couple of days! I’ve been testing InstaNatural’s Stretch Mark and Scar Cream out primarily on my recently formed stretch marks after my second pregnancy (I didn't get any with the first! ), and whilst I don’t have many, I have enough to give this product a thorough test. Even though it hasn’t made any stretch marks disappear completely (and doesn’t claim to), there is a very noticeable difference in comparison to how they looked before. Not only this, but I’ve only been using this product for a week so far and to be seeing such results so early on really shows how well this product works! In regards to the actual application, I find that the cream takes a short while to absorb (but definitely no where near as long as some other products in existence), but it does so faster with a gentle massage. Once it has soaked in there is no greasiness left behind. I don’t think that stretch marks are anything to be ashamed of, especially after having children. Mothers with stretch marks are tigers who have earned their stripes. Instead of cowering away they should be ready to roar. Even those stretch marks that are a result of growing up are nothing to be bothered by. Almost everybody has them! But for those who do want to reduce their appearance, InstaNatural’s Stretch Mark and Scar Cream is a fantastic product. 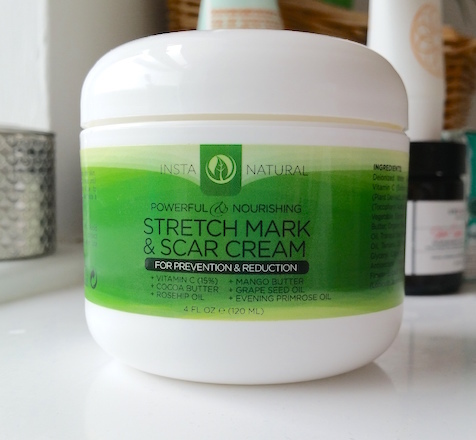 You can purchase a pot of InstaNatural’s Stretch Mark and Scar Cream for £23.95/120ml from Amazon. What are your thoughts on the InstaNatural Stretch Mark and Scar Cream? Are you bothered by stretch marks at all? Great review, I'm a sufferer too. My skin is just so unstretchy and I swear my cocoa butter for them, so cheap but I've noticed a real difference. I'll be sure to give this a try too! It's well worth a go if you're looking for something to help combat them for sure! Since writing this review I've noticed even more of a reduction in their appearance with continued use.